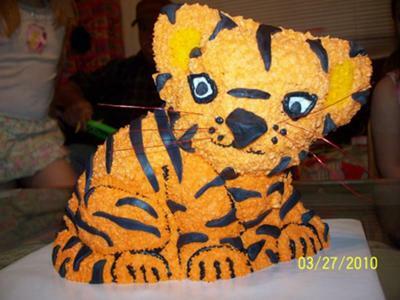 For this 3D tiger cake, I used the 3-D stand up lion pan I bought on Ebay. It took one cake mix. Grease and flour both halves of the pan. Add prepared cake mix to front side of pan. Then snap the back side of the pan in place and bake according to directions. After baked, let sit in pan a while. After removing from pan, put on cooling rack until completely cooled. After cooled, place on your prepared board. I added one skewer for support. I put it right through the head, down through the neck and into the board. I iced in buttercream. The colors are orange, yellow, black, and white. I used a round tip for the black outlines, a star tip for the orange and a large round tip for the yellow. I also let the yellow dry a bit and used a Viva towel to smooth. I did all the outlines first then filled in with the orange and white. After that was done I added the yellow in the ears. Then came the fun part. I made home made marshmallow fondant. I colored it black. I rolled it out and used a sharp knife to cut 'stripes'. If the stripes didn't suit me, I used my fingers and molded them. I just stuck them right on the icing. I also made two small round balls to put in the whites of the eyes. I used some small diameter pieces of copper wire for the whiskers. We recently had our 57th wedding anniversary and I wish this lady lived close enough to me (but since I live in Washington State it is much too far) so she could have baked us a fabulous cake. She is one talented lady and I hope she goes far with her decorating. This lady is so amazingly talented! She does such a marvelous job and is so creative. I wished she lived close to me, so I could take advantage of her originality in the intricate cake decorating she is so capable of.